Monday evening: Clear, upper 30s and breezy. Monday night: Mostly clear and chilly. Lows in the 20s and 30s. 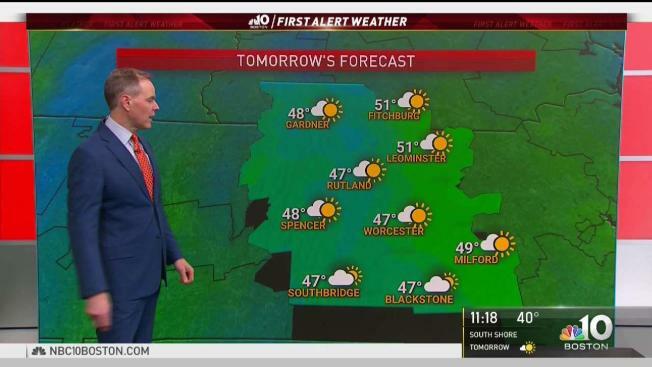 Tuesday: Sun, then more clouds late. Highs around 50. Coastal storm approaches overnight, bringing wind and rain to the southeast. A nor'easter could bring snow, wind and rain to parts of New England this week. Monday's wind slowly subsided at night, with overnight lows in the 20s. Southern New England continues to thaw Tuesday and will see highs in the low 50s with increasing clouds, while northern New England will be in the 40s and mostly sunny. An interesting coastal storm heads our way Tuesday night into Wednesday morning. The quick-moving system will bring gusty winds, heavy rain and rough surf for southern and eastern New England. Oh, and there is a chance for some wet snow. The timing is key, with the wet snow falling during the predawn hours and the snow could be heavy. If that's the case, then we will see light accumulation across the Worcester hills before it melts in the mild April sun in the afternoon. Wind gusts will be between 20 and 40 mph from Cape Ann to Boston, inland toward Worcester. Some 40-60 mph gusts across the southeastern coastline and on the islands from the northeast are possible Wednesday morning. As the storm pulls away from southern New England, wet snowflakes will mix in across Boston and as far south as southeastern Massachusetts and Providence before drying off late morning. By afternoon, our highs will be back in the 50s! Tides are a tad higher due to the new moon on Friday (around 9 feet around 11 a.m. in Boston Wednesday), but not as high as the king tides last month. The wave heights will be 10-15 feet offshore as the storm passes southeast. Wind will be onshore from the northeast just before high tide, turning offshore around high tide. We are not expecting any big coastal flood issues, but will keep watching the model trends on that detail, as well. More seasonable high temperatures in the forecast this week, with 50s for Thursday and partly cloudy. Temperatures will be in the low 50s Friday and a system brings in scattered rain through early Saturday. There will be a clearing for the second half of the weekend and more mid 50s, 60s farther inland. More 60s are on the way Monday and Tuesday. The Red Sox' home opener will be spring-like and warm around 60, with scattered showers. Showers linger into Wednesday with highs around 60.